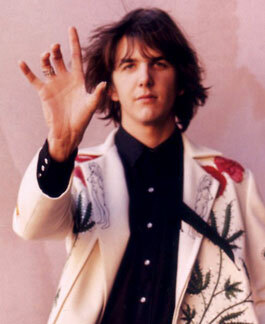 Regular Joe: Gram Parsons & Thousand Dollar Wedding - A Strange, Beautiful Song. Gram Parsons & Thousand Dollar Wedding - A Strange, Beautiful Song. * Back before the internet and on-demand music everywhere, a friend turned me on to Gram Parsons - the Southern Boy who kinda invented Country Rock, taking a traditional music, mixing it with a bit of Southern Gothic (and his own strange family history gave him plenty of material there) and a bit of Rock and Pop to produce something new and beautiful. As the official website dedicated to his memory points out (with justification) Parsons is probably up there with the likes of Elvis, Dylan and The Beatles in terms of his influence, which you can hear in any pop or rock song that has a country twang. He did "straight" country - such as his masterful version of The Streets Of Baltimore - and he did rocked up country. And beautiful ballads such as Hickory Wind. He was gifted, a dreamer, tragic, and weirdly elusive and unknowable, no two photographs of Gram quite look the same and he didn't really write or sing songs about himself, it was more universal themes of place and feeling. With his Georgia, Southern Gothic background and his poetic style, he's as if Tennessee Williams went into music instead of writing stories. You can read a good telling of the Parsons Story on the best website dedicated to him, here; The Story of Gram Parsons - and it is a story well worth reading - from his strange childhood, hanging out and influencing The Rolling Stones (in the process proving that no man alive should try to keep pace with Keith Richards when it comes to pharmaceuticals) to his tragic death. But mostly it's about the music. And I always come back to Thousand Dollar Wedding - an incredible short story in soaring song. The story seems to be about a wedding that should - but didn't take place. You can almost imagine the groom and Gram as best man, sitting in a smoky dive bar somewhere, still in their suits and sipping whiskey as they sing this sad one. But what happened? Who left who at the alter? All we know is, it's been a bad, bad day. He took some friends out drinking and It's lucky they survived..." remind me of another break-up at another time and how men in particular react to romantic disaster. Gram played with The Byrds and was a major influence on the classic Sweetheart of the Rodeo album - another of my all time faves along with his own Grievous Angel. But where you should start is Thousand Dollar Wedding. Listen to Gram and Emmylou Harris duet on a strange tale of a wedding that didn't happen. The soaring middle part of the song, after the first part of the duet, is extraordinary. It's just a beautiful, haunting song. It was released on the Grievous Angel album four months after his death in 1973. And I hope I haven't oversold this - you can listen to it here - with the lyrics below. It's been a bad, bad day. Totally awesome song. I have been wondering what it meant for decades.